The Life of Henry Hook V.C. Henry Hook was a working man, born in rural Gloucestershire without the slightest advantage in life. He became famous after winning the V.C. 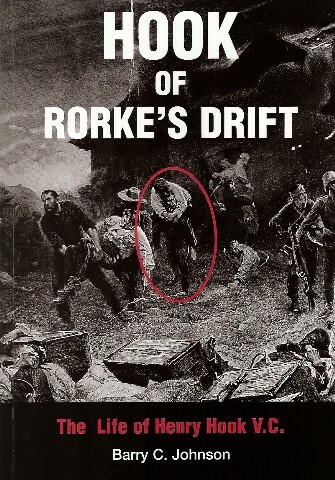 at Rorke’s drift; but he also won an entry I Who’s Who and was featured in two cigarette card series. At his death in 1905, he was given a funeral fit for a filed-marshal; and forty years later, his granddaughter became Birmingham’s first woman MP. Hook was exceptional in serving in all three branches of the land forces of his day: the regular army, the Militia in Monmouth and the Volunteers in London. In civil life, he was a woodman, a groom, a book duster and umbrella caretaker at the British Museum – the only V.C.-winner in the Museum’s history. His early years have always been mysterious. Was he married before he enlisted? Did his wife (legal or common law) think that he had been killed by the Zulus and sell his property? And if so, who was the “mystery” wife and did she bear Hook’s children? These problems are finally settled in this biography, in which Hook’s life can be seen in detail and “in the round” – his ancestry, his family and friends, his civilian jobs, as well as his very varied military career. It can be seen at last how and why he became the most famous private soldier in the annals of the British Army. Copies of Hook of Rorke's Drift (ISBN 0-9517115-6-3, Paperbound Edition) are available priced £14.50/$29.00 (includes postage) from Bartletts Press, 37, Larchmere Drive, Hall Green, Birmingham, B28 8JB, United Kingdom. Cheques, etc. should be made out to Bartletts Press. (PLEASE PRINT THIS PAGE AND MAIL TO ADDRESS ABOVE). I would like to order _____ copy(ies) of Hook of Rorke's Drift at £14.50/$29.00 each.